Creative Wedding Formals are what we are always looking for on the day of our weddings. This photograph taking at a Luxury wedding in Toronto is one of our favourite photographs we have taken. We most often take our brides and grooms out for evening formal photos to take advantage of a beautiful sunset or use some lighting techniques to create something that wasn't available earlier in the day. 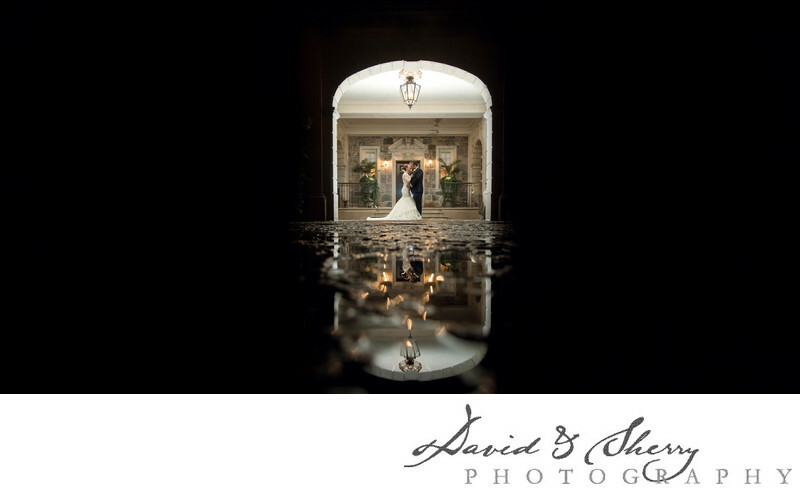 This particular shot was taken on a rainy evening where the falling water had let up for just a few minutes allowing little puddles to remain still all over the front courtyard of one of our favorite venues, Graydon Hall. We got down low and I'm sure a little bit wet to get a fantastic reflection in the water of our couple lit by a flash placed behind them. We were left with a rim lit bride and groom surrounded by the bits of stone and concrete that were not covered in water. I believe this to be a unique wedding photo taken in Toronto. Joe & Laura are two people to whom style and fashion matter. One makes custom jewelry, including the ring for Laura, and the other is a consultant to the fashion industry. Both are wonderful and fun loving people whose wedding was equally so. Their rainy day wedding wasn't something they were disappointed of due to the fact they chose a venue that allows for rainy day photos. They had a fall wedding, got married inside, had a beautiful dance floor for their 150 guests, and had amazing food prepared by couture cuisine. Nicole Pieckenhagen is a master of hosting weddings and events and is one of the best in Toronto, and is certainly someone with whom you can trust your wedding. As a result of this photo we will contiinually look for reflections when we are out photographing our luxury clients.